I was super-excited when my subscription copy of this issue of JUSTICE LEAGUE OF AMERICA turned up in my mailbox, folded in half as was the custom of the time. That’s because it was the first part of the annual Justice League/Justice Society team-up. While I was familiar with the JSA, the only previous team-up I’d read was a reprint. This was the first time I was on the ground floor when the action kicked off. Unfortunately, and there’s no way to put this delicately, this was a mess of a story and a mess of a crossover. You may have heard of it before, it’s pretty legendary as these things go. Supposedly, inspired by a spate of stories in which the creators would involve themselves in the action (which wold have included Cary’s own Flash: Fact or Fiction and the later issue where he himself teamed up with the Flash), writers Cary Bates and Elliot S! 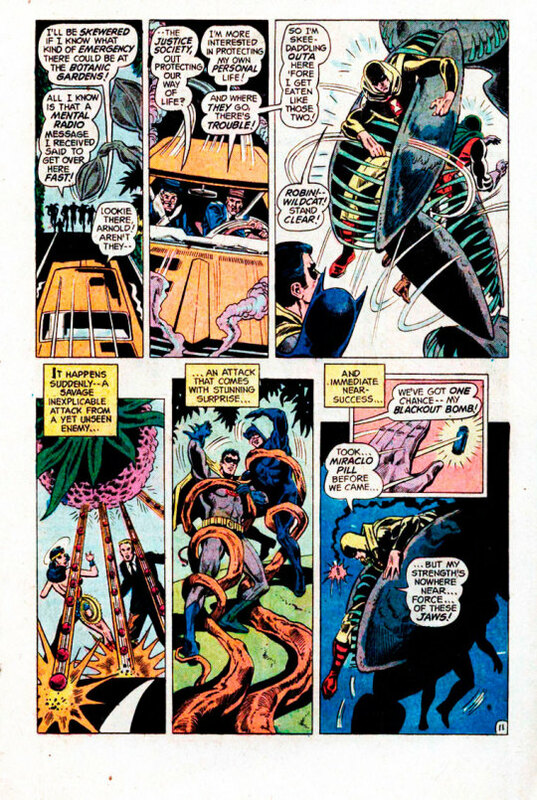 Maggin decided to feature themselves in this year’s team-up, reportedly with the intent of making it so egregious that other people would thereafter stop doing this. I don’t know, I find that motivation pretty spurious–can we really believe that Cary, Elliot and editor Julie Schwartz deliberately put out a bad story for such shaky reasons? My household eventually had two copies of this gem of an issue, the second one bought for my brother Ken at some point. That’s a pretty ugly cover, a good representation of what I mean when I say that Ernie Chan/Chua was not conversant with the specific exaggeration needed to make super heroes look good. Here, all of the heroes appear to be stock-still statues, with some weird facial expressions. It’s meant to be dramatic, but it comes across as a guy yelling in a wax museum. The issue opens with writers Cary Bates and Elliot Maggin in editor Julie Schwartz’s office on Earth Prime, the world you and I live on. They’re trying to brainstorm an idea for the next issue of JUSTICE LEAGUE. When Julie goes off to get himself some chili, Cary and Elliot hit on the notion of doing a follow-up to Cary’s story in which the Flash visited Julie. 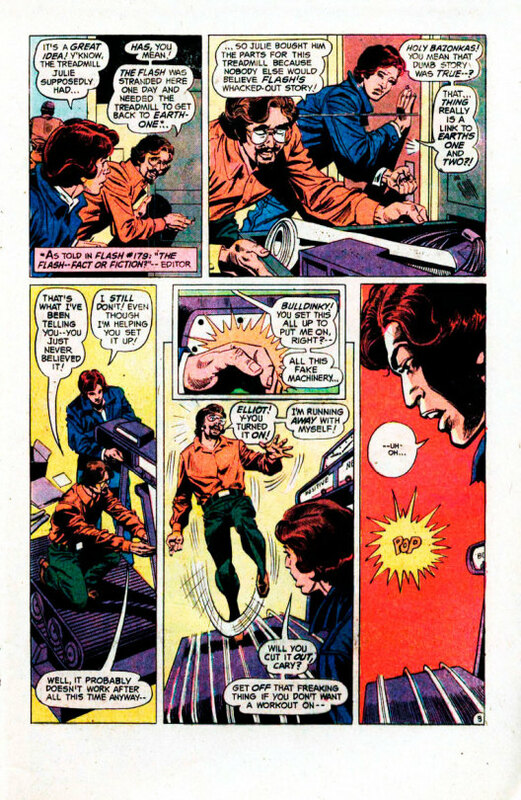 Digging out the cosmic treadmill that Julie for some reason still keeps in the DC offices, the pair accidentally activates it, sending Cary racing on a one-way trip to Earth-2. En route, Cary is bedazzled by a mysterious energy, turning his thoughts criminal. 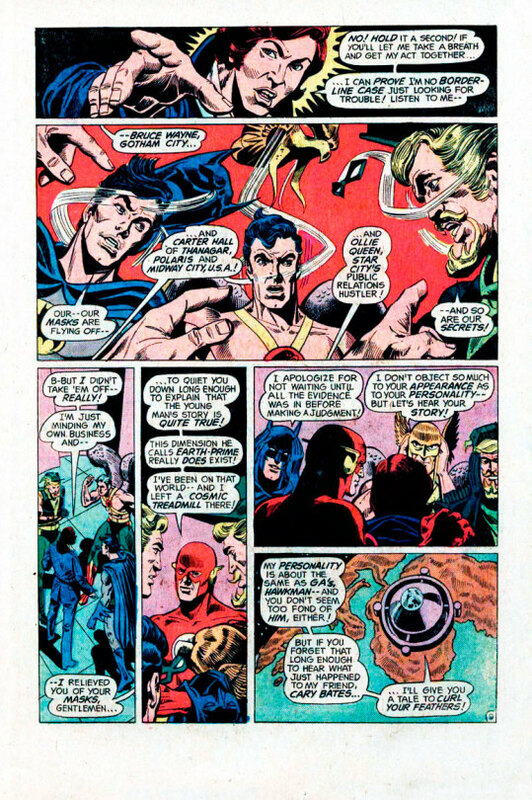 So that when he arrives and sees members of the Justice Society attempting to apprehend some fleeing criminals, Cary uses his ability to plot stories to conjure them up an escape vehicle. back on Earth-Prime, Elliot and Julie are mystified, and Elliot decides that the only thing to do is to go after Cary–nevermind that one is supposed to need super-speed in order to activate the treadmill. 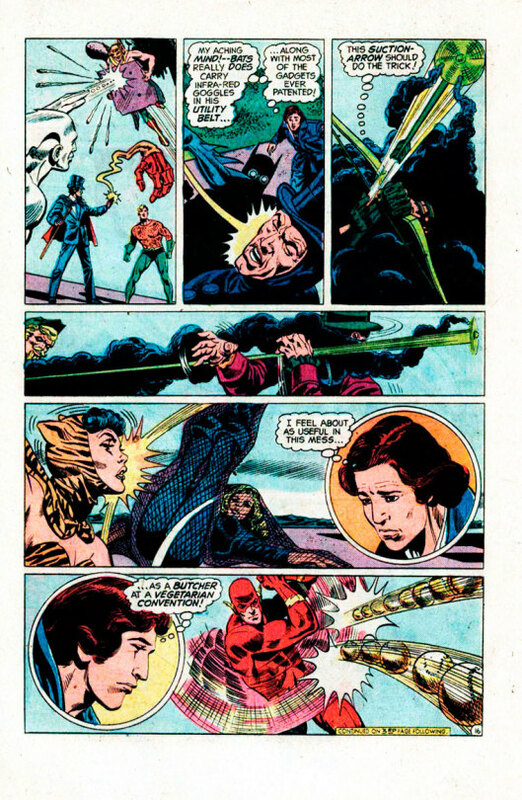 Crashing down in the water, Elliot is rescued by Aquaman, whom he somehow convinces to take him to a JLA meeting. There, Elliot explains what’s going on, and uses his intimate knowledge of the JLA members to convince them of the truth in what he says (with a bit of help from the Flash.) Meanwhile, on Earth-2, Cary, now decked out in a garish super-villain costume, continues to act as a menace, throwing perils at the Justice Society and ultimately defeating them. 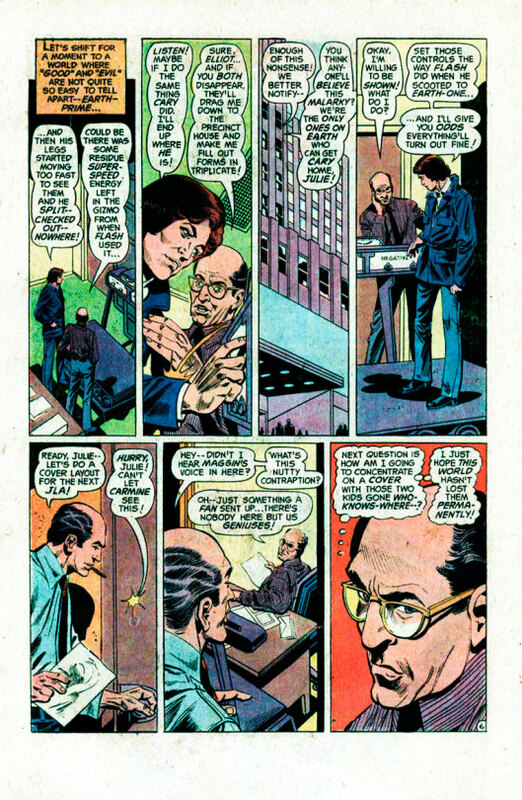 Cary’s change of heart is due to the sorcery of the Wizard of Earth-2, who for some reason thought that an interdimensional comic book writer would make a good pawn. Together with the rest of the Injustice Society, the Wizard has been pulling Cary’s strings, making him attack the JSA. 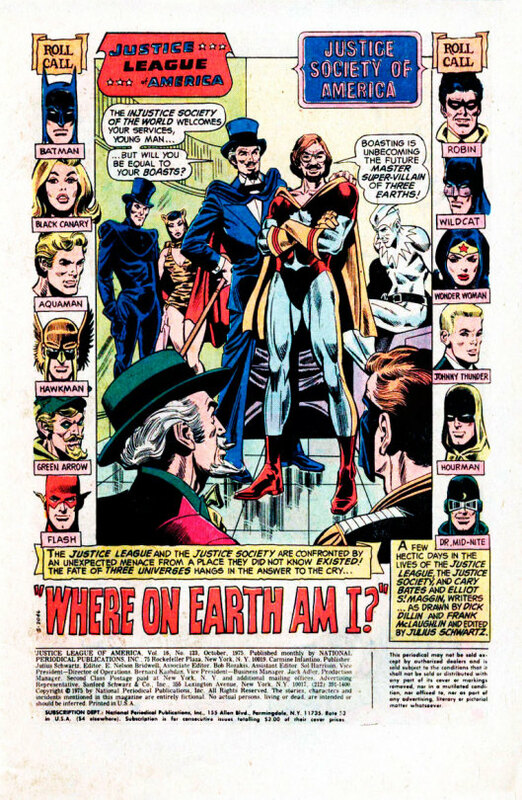 On Earth-1, The League members can’t locate Cary, but as the universes are at their closest point of contact in years, they expand their search to Earth-2. Zapping over to the neighbor Earth, the team is immediately jumped by the Injustice Society. The League beats the pants off of the Injustice Society members–so much so that they all wind up (bloodlessly) dead. 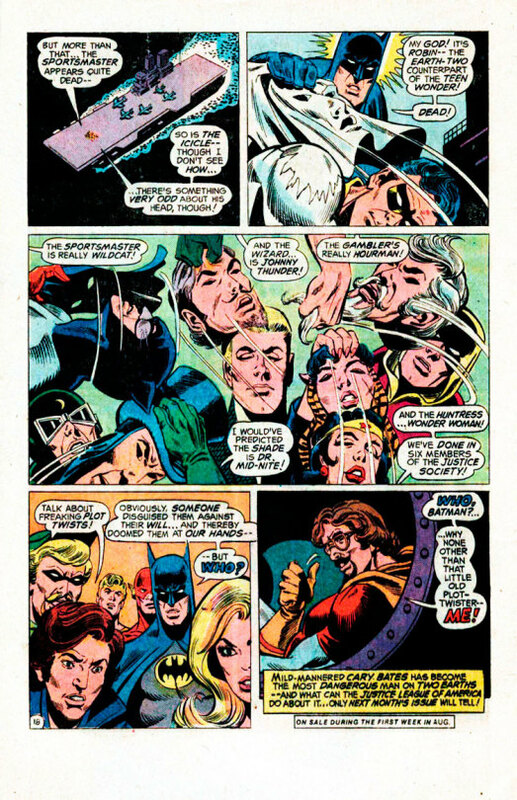 Then comes the final plot-twist, as the now-deceased Injustice Society members are unmasked as actually being the JSA. So the League has now killed the Society…and in the shadows, evil Cary Bates laughs and gloats! To be continued!